recently i keep seeing posts about walls a lot. petit cabanon posts about nuno coelho and adam kershaw’s exhibition, including this comparison between the berlin wall with the wall between israel and palestine. lebbeus woods proposed walls as infrastructure for havana, cuba, also with an intro on the berlin wall [and excessive fascination with the aesthetics of informality, imo]. and in the news, the recent arizona law brings up the issue of of the border wall between mexico and the us [click here for some borderwall as architecture]. these very famous walls remind me of some of the walls that have been built in the last ten years in ecuador, where i’m from. i’d like to show you some of them. this is the wall between an existing town called buijo historico and a new-ish gated community. the wall is 8 meters high [more than 26’], which seems to be about the height of the wall between palestine and israel. the idea of course is that nobody in the new gated community would buy if they realized how close the town really is. the town is called “buijo historico” [historic buijo] because it lodged simon bolivar before he went into guayaquil [whether he invaded, liberated, or conquered guayaquil depends on who you are reading]. guayaquil is my hometown, a city surrounded by horizontal growth consisting mainly of invasions, privatized low income single family housing, and gated communities. in the example above, the town happened to be located in a piece of land that suddenly became very valuable. 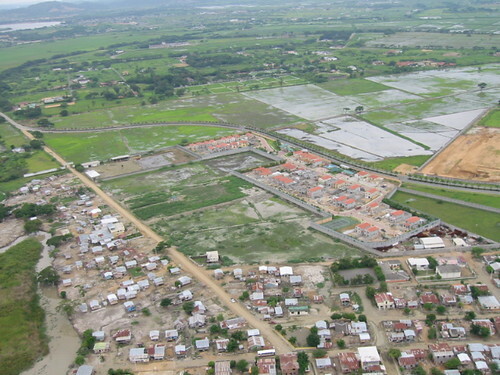 on a reverse type of example, the following gated communities were planned as low income social housing near santa elena [zoom out to get the full picture], in the coast of ecuador. these are my pics of the billboards some brilliant marketing exec planted in front of them a few years ago in a campaign for overpriced furniture [“exceptional comfort” and “environments that thrill”]. because poor people have a right to gated communities too! [actual paraphrasing from our socialist president, although not referring to these examples]. most of the people that live here have no cars, and have to wait for a bus to stop in the middle of a high traffic highway in order to get access to anything. in this increasingly privatized environment, the city hall of guayaquil started renovating its public spaces, and promptly fencing them. under the guise of saving the city, the city itself was transformed into a series of walled spaces of atrophied publicness. the success of these spaces, in a city starved for public space, was confused with the validity of privatization as a strategy [x. andrade has written eloquently about this phenomenon and its consequences]. finally, new urbanist champions andres duany and elizabeth plater-zyberk are responsible for these upcoming gems: that’s right, moats replacing walls. i could say many things about this project, and there would be lots of four letter words involved, but i’ll let you come to your own conclusions. my own opinion might be slanted since i was involved in an academic exercise funded by the region’s city hall to project the future growth of this area. still, i’d like to believe my bitterness is pure and uncorrupted. the border walls of berlin, palestine/israel, and mexico/usa are [or were] political walls, polemically separating zones of conflict, often the cause of disagreement and always the site of great tension. the 8 meter wall between palestine and israel tells us of the enormity of the problems between these countries. 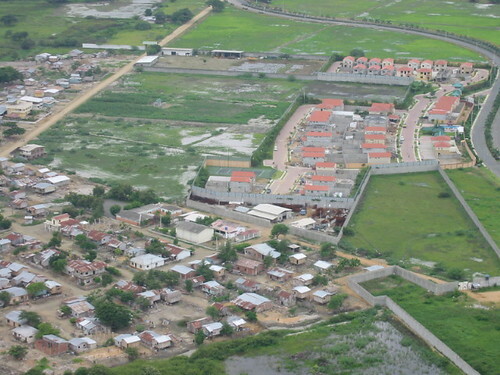 the 8 meter wall between a small middle-class gated community and a small river town in ecuador is a caricature. the walls [and non-walls] popping up in ecuador come from an increased privatization of life, the constant [real and increasingly imagined] threat of delinquency, and the need to hide reality in order to imagine an idyllic life. in ecuador, walls hide dirty secrets and nasty realities and let us pretend things are ok. walls separate income levels and teach us to fear difference. walls make us deny everything that we are, and prompt us to pretend what we are not. walls increase intolerance, discrimination, and fear. and they give me a headache. let’s get rid of them. ps. related, entrevista con marc auge, via paco gonzalez.